Does you foot look like this? A verruca is a type of wart that is usually found on the soles of your feet and can often spread into small clusters. To begin with verrucae look like small, dark, puncture marks on your feet. However, they can then often turn grey or brown. Although verrucae are harmless, they can often cause a burning pain when they are in weight bearing areas. SEE SWIFT VERRUCA TREATMENT FOR MORE INFORMATION. Within a general podiatry treatment a foot examination is carried out to establish the problems and the problems are then treated. Treatments can include Nail Care, Reduction of Corns and Callous. 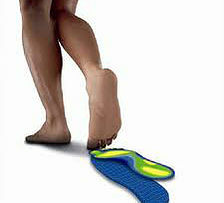 Foot care advice will also be given to explain the best ways of maintaining foot health. If required we can also provide information for specialist treatments. Nail surgery is a minor operation that is carried out under a local anaesthetic due to having an in growing toe nail. 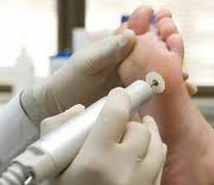 During this procedure part or all of the toe nail is removed providing a permanent solution to the problem. The local anaesthetic is injected into the toe which makes the toe numb throughout the procedure so the patient feels no pain. Once part or all of the nail is removed a solution is then put on the nail to prevent re growth. Care has to be taken after surgery to keep the toe dry, it also must be re dressed regularly. Healing time is generally 2-4 weeks. However, this depends on age/health etc. 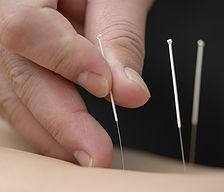 Acupuncture is where the skin is penetrated by small needles to stimulate certain areas of the body. These points within the body run in different meridians or channels. This is a procedure that dates back to 2000 years ago and was originated in China.